Click on this link if you need more information about Stepper motor. The 3540M/MO step motor drivers are microstepping drives with up to 12,800 steps per revolution, step phase sequencer with MOSFET three state switching amplifiers and optoisolated circuits. Both drives include 5 optically isolated inputs, and the 3540MO features external speed control, tach output, and internal pots for accel/decel rate along with high/low speed range selection. The 3540M drive is a step and direction drive, and includes an automatic feature (switch selectable) to lower motor current by 50% anytime the motor is left at rest for more than one second. Additionally there is a switch-selectable self-test which rotates the motor 1/2 revolution in each direction at 100 steps/second. This drive is compatible with PLCs which feature high-speed pulse output, such as our ELC-PLC series and OCS XL series. Note: the Step, Direction, and Enable inputs are +5V-logic compatible. For operation with +24V signals, a 3600-ohm series resistor is required on each input. See the drive manual for details. The 3540MO drive has an on-board oscillator which allows the motor speed to be controlled by an analog voltage or external joystick. This drive is ideal for continuous motion applications such as mixers and blenders. A tach output is also available on this drive. 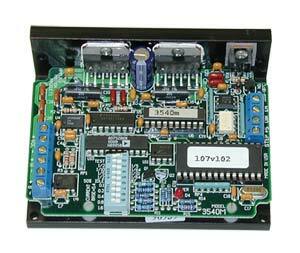 Motor current for both drives is selected from 32 levels by a DIP switch. Microstepping resolution is selectable by DIP switch on the 3540M. On the 3540MO, microstepping resolution is fixed at 12,800 steps/revolution. Note: To see torque-speed curves for recommended motors, click on "Specs" above.